Over the holidays I worked my way through the Introduction to Computer Science course at code.org. It seemed a very engaging way to introduce children to computer science. As a reliever, I get very limited opportunities to try out new things in the classroom so I was delighted to be able to try out this resource on a year 3 class the other day. In this school, computers are still in the library with each class having set times for ICT. The children usually work on educational games/powerpoints/word documents etc so this was something a little different. We had been working on problem solving in maths that morning so I used that as a context for the session. I showed the children two of the introductory videos in the classroom (listening to the videos would be difficult in the computer lab). I stopped the videos and repeated parts that I thought the children might struggle with. Having worked through the course myself, I already knew some of the areas they might find tricky. Then I sorted them into buddies, gave them each a slip of paper with the URL for the site and off we went. The levels start off very simply but the complexity does ramp up a bit once the concept of loops is introduced. I suspected that they might struggle a bit with that and most of them did. Some steamed ahead though and a few groups got up to level 9-10. What impressed me the most were how totally engaged they were in solving the puzzles. Even when they had to do a level multiple times, very few of them got discouraged. They just tried again. Having familiar contexts like Angry Birds and Plants vs Zombies really helped to drive engagement too. Thinking - the children are actively problem solving, trying out their ideas, seeing what works and what needs to be changed. Using language, symbols and text - coding requires the children to use language in a very precise way and also to understand concepts such as "repeat". Managing self - the children had to learn to deal with failure and to reflect on what needed to be changed to succeed. Relating to others - the children worked in pairs and shared their ideas with their buddy on how to solve each puzzle. 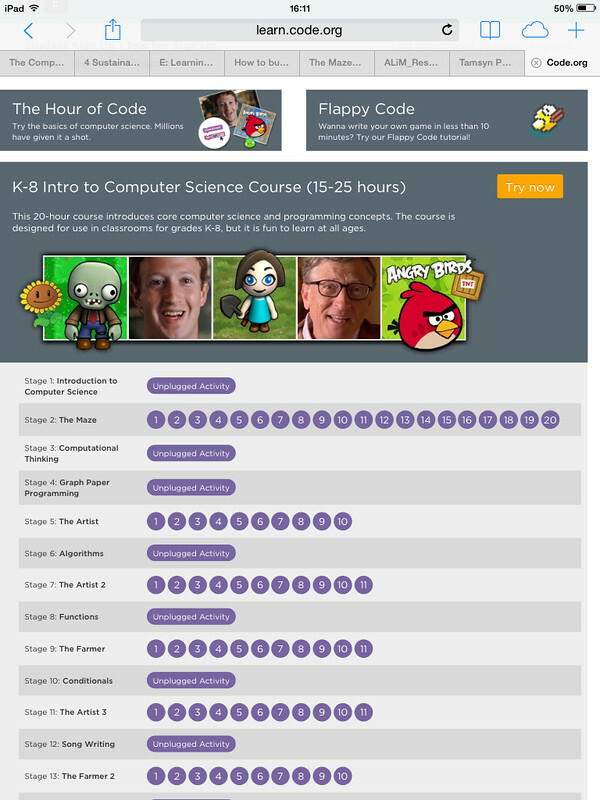 I barely scratched the surface of the code.org course (which includes off line activities) with the children. I would love to see how the full course worked with a class.